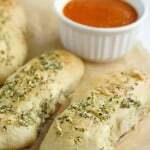 Home » Appetizers » Vegan Garlic Herb Breadsticks with Marinara Sauce. 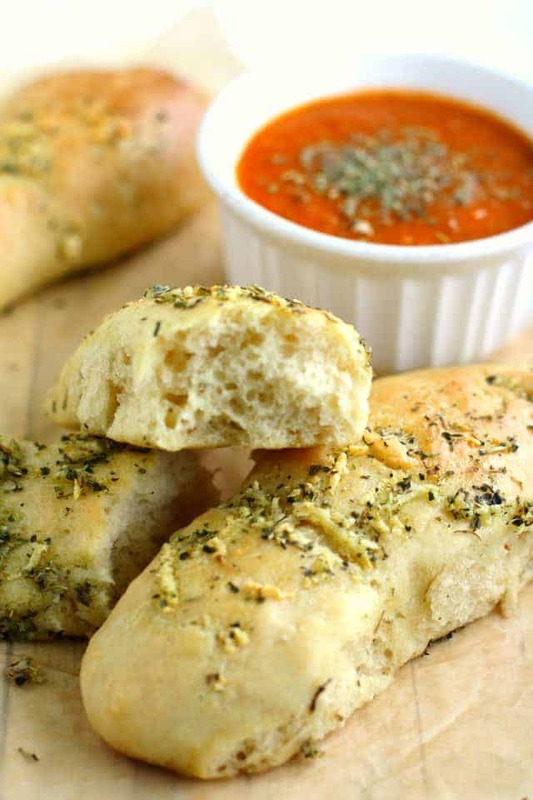 Soft and fluffy vegan garlic herb breadsticks are a family favorite! These are easy to whip up and are a perfect accompaniment to pasta! You guys, I’ve been hearing Olive Garden commercials on the radio lately, and I’m thinking that these ads are getting in my head, because I actually found myself wishing for a pile of their soft, buttery, (bad for you), breadsticks. And also their salad, and maybe some soup, too. Thankfully, I can make vegan garlic herb breadsticks at our house that aren’t as bad for us, and we all love them just as much! I used white spelt flour to make these vegan breadsticks, and I do let them rise for about an hour for maximum fluffiness. I’ve gotten a few questions about spelt lately, and as I’ve mentioned before, spelt is not gluten free. My sons and I can’t tolerate wheat, but we are able to tolerate spelt very well, and it doesn’t cause any reactions in us. Spelt is an ancient grain that is lower in gluten, and as with most ancient grains, has not been genetically modified. You can read a little more about it here and here. Okay, back to these breadsticks. The dough is super easy to mix up, and then you form the breadsticks and let them rise – I prefer at least an hour. I make a quick little garlic herb oil to brush on the tops, and serve them with marinara sauce. My recipe for homemade marinara sauce is here, but if you don’t have all day to make that, just use your favorite jarred brand. 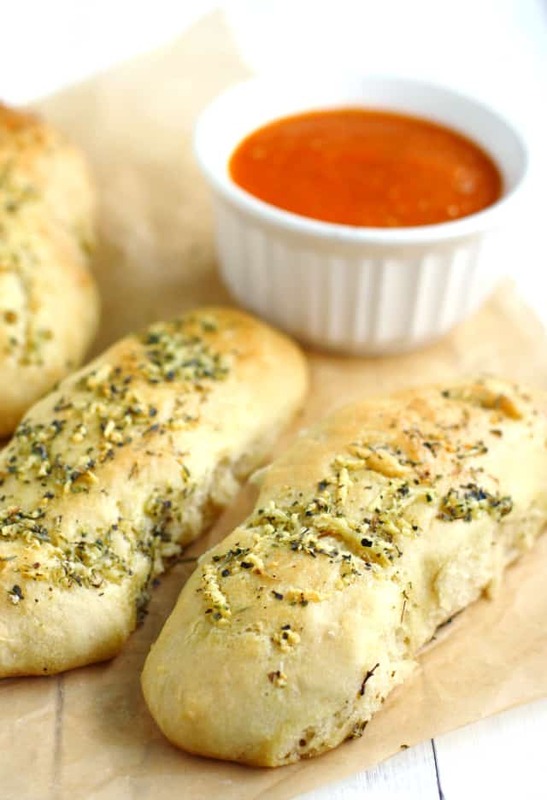 Make these vegan garlic herb breadsticks this weekend – they are delicious, and you’ll be super happy with how awesome your house smells – it’s heavenly on a crisp autumn day! 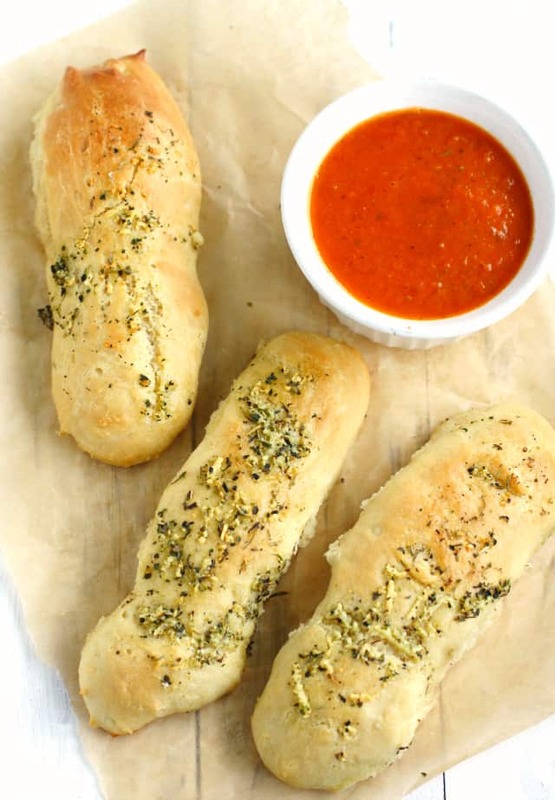 These spelt flour vegan breadsticks are topped with a herbed garlic oil and are delicious when dipped in marinara sauce! Dairy free, egg free recipe. Put the warm water, brown sugar, and yeast in a large bowl, and let sit for about 10 minutes so the sugar feeds the yeast. It will look a little bit foamy on top. Add the spelt flour, salt and 1/4 cup of olive oil to the yeast and water mixture, and mix together. Knead the dough with your hands just a little bit until it is smooth and elastic. If it seems too wet, add a bit more spelt flour. Take a handful of dough, roll it into a log, and place it on a parchment lined cookie sheet. Stretch it out until it is about six inches long. Repeat with remaining dough. You should get about 8 breadsticks. Mix the crushed garlic, Italian seasoning, and 3 tablespoons olive oil in a small bowl. Brush this mixture over the tops of the breadsticks. Bake at 375 degrees for 10-15 minutes until golden brown. Enjoy with warmed marinara sauce for dipping if desired. You can also just brush these with olive oil and sprinkle garlic salt on top for a simpler version. « Beef and Broccoli Teriyaki Noodle Bowls. This is such a great recipe! My boyfriend has a dairy allergy, and he misses garlic bread, so this was PERFECT. I used regular dry yeast and all purpose flour, and made them into small twisted loaves instead of sticks so they’re easy to pull apart. So delicious, thank you!! These are sooo good. But just fyi olive garden actually uses soy instead of butter for their breadsticks, their minestroni soup is vegan, and you can order the salad with balsamic vinegar instead of salad dressing! 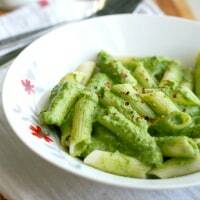 Plus you can substitute the cheese out of most vegetarian dishes for veggies or pasta. So feel free tostart going again! P.s. you can find more on this topic on their website theyre very thorough with their explanation of it all. I cannot tolerate spelt flour. I made these using my own all purpose GF Flour ( brown rice flour,tapioca & potato starch). They were not fluffy & had no flavour. Can you suggest a GF flour that would work with this recipe. Thank you. I’m sorry, I haven’t made these with gluten free flour. I don’t know what blend would work. Erin, I use extra virgin olive oil it works really well. Olive oil is the only type of oil i use. And I make these often. I even make it without the toppings to make buns. I make these all the time. But I use just the dough recepie because it’s so good and I often add rosemary to the dough. Great quick bread stick recipe. Also made rolls with the same dough nice light and airy. So glad you liked this recipe! Thanks for letting me know! Is it typical for spelt flour to rise sideways more than upwards? This is my first time baking with spelt and my rising seems kind of off compared to conventional bread. They taste great and the crumb looks similar to yours! So maybe that is normal? Either way, I will definitely make these again! I’m not sure – I haven’t done a lot of baking with all-purpose flour. I would say these breadsticks do spread out a bit though. Has anyone premade and froze any of the dough for later use?? Was thinking pre making and taking frozen dough out at lunch when I come home. Then when I get home to start dinner they will be ready to go in the oven (unthawed and had time to rise). Hi! Is the serving size 1 breadstick in your nutritional facts? These look so tasty! Is there a yeast substitute that I could use? I don’t know of a yeast substitute, I’m sorry! Made these for Easter dinner and my family told me I’m required to bring them to every family gathering. So easy and there’s a lot you can do with them, thanks! Could this work with oat flour? Oat flour is kind of heavy, so you may need to mix it with another flour. These breadsticks were delicious and amazing! But the dough did lack taste so I added another teaspoon of salt and it did the trick! Overall, the title does not lie: these are soft and fluffy but I did a coat of the topping before putting them into the oven and after pulling them out! I will definitely be making these breadsticks again! Could i use vegan butter instead of oil? And regular vegan sugar instead of brown? And regular yeast instead of quick rising? Yes to the vegan butter and sugar, and I think the other yeast would work, but I haven’t tried that. You mention 2 lots of olive oil.hiw are these used in the recipe please? I just updated the recipe! Thanks for alerting me to the issue, it’s much clearer now. The 1/4 cup goes in the dough, and the 3 tablespoons is for the garlic topping. These look good! Question: Does the 1/4 cup of olive oil get mixed in with the dough? i was curious about this too…. Yes it does! I just updated the recipe! The 1/4 cup goes in the dough, and the 3 tablespoons is for the garlic topping. Yay! Great news, thanks for letting me know! Olive Garden breadsticks get me every time, their so delicious! But these vegan ones look even better, Kelly! Love how soft and full of flavor they are! I never came across bread sticks until I went to America and ironically, Olive Garden (i think it was all you can eat salad and bread sticks!) and now I can recreate it! YUM! These breadsticks look amazing, Kelly! Love the marinara dipping sauce, lush! Breadsticks are just so good. I swear, I could have just breadsticks for dinner and I would be a happy girl! YUM! I love breadsticks. These look so delicious! I used to go to Olive Garden for big group dinners, too! I know, I think it was a popular spot for dinners with friends, right? Kelly, these breadsticks are calling my NAME. They look so so soft and fluffy and your photos are gorgeous! Thanks, Sarah! I really appreciate that! I’d totally dig these gluten-free ;) love it! I know, I should see if I can make them work gluten free! Has anyone tried making these gluten free with success?